From: Wahan, jahan pyar mile :-) ! forgive me if I miss replying or reading ur post............bit busy :-( ! sach hai duniya waalon hum hain anari ! Shankar Jaikishan- Composers with magical touch !! This year we CELEBRATE 60 years of Shankar Jaikishan music . come join the celebrations ! 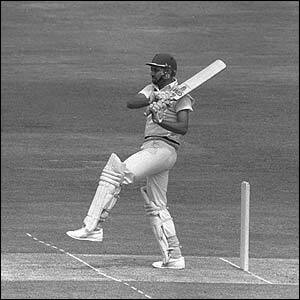 FOW: Gavaskar (2-1), Srikkanth (59-2), Amarnath (90-3), Yashpal Sharma (92-4), Kapil Dev (110-5), Azad (111-6), Binny (130-7), Patil (153-8), Madan Lal (161-9), Kirmani (183-10). 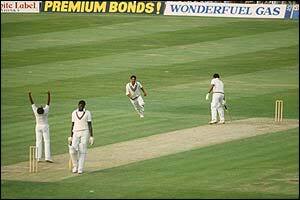 FOW: Greenidge (5-1), Haynes (50-2), Richards (57-3), Gomes (66-4), Lloyd (66-5), Bacchus (76-6), Dujon (119-7), Marshall (124-8), Roberts (126-9), Holding (140-10). Iam compiling more info from that WORLD cup so keep watching this POST !! Great pics sonu, thx a mill man! 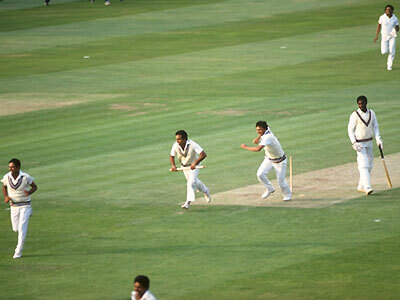 "To be in a minority of one does not necessarily render one insane"
Some memorable quotes after India won the World Cup. 'My slogan is: "Indians can do it" '. 'Simply thousands of miles away you could almost smell the joyful whiff of November 5 cordite, mixed in the sultry scents of jasmine, frangipani, cowdung smoke and curry'. 'A feat, which will rank among the finest achievements of the country'. 'I have had to eat some of my own words, but what a delight it has been to do so'. 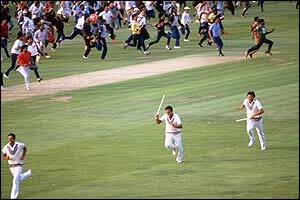 This was the last time the World Cup was held in England, before its migration to the subcontinent and Australia. It was also the year of the underdog. 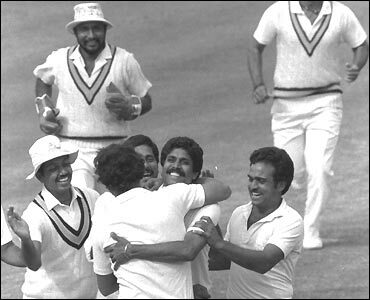 The first two World Cups had been won by the clear favorite -- this one produced a sensational turnaround with 500-1 outsiders India upsetting the West Indies applecart. anybody have 1983 World Cup Final/Semi Final?